Pumpkin dishes don’t necessarily have to be sweet. 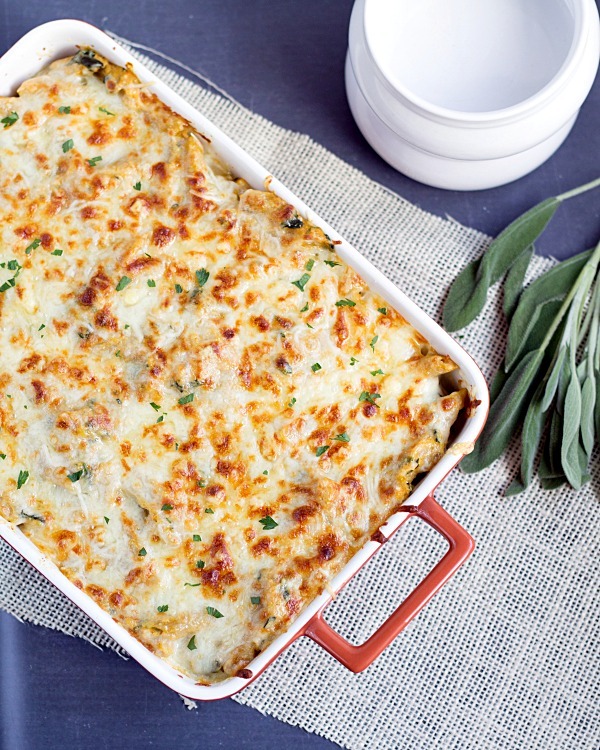 Take your next pumpkin dish to the savory level with this Four Cheese Pumpkin Pasta Bake! Want to stay up to date with This Gal Cooks? Let’s be friends! Hooray for Friday! You’ve probably heard that from a few different people today, haven’t you? This week has been a surprisingly good week for me. Surprisingly good because we had our system conversion at work on Monday. Things have gone pretty smooth for the most part. There were a few hiccups but that comes with a system conversion. Today I’ll be leaving work a little early. I have to take the little one – little one as in pup – to the vet. She’s due for her follow up check up to make sure that her skin infection has ceased to exist. She’s so funny when I take her to the vet. She gets extremely excited to go for a car ride but once we step foot in the vets office she turns into a nervous wreck. She walks to the door as if she will be able to leave. I feel bad for her. I’m not sure why she is like this now. When she was younger she didn’t mind going to the vet. She wasn’t thrilled about it but she didn’t go into panic mode either. I attribute her change in attitude to her age. She’s 13 1/2. She’s quite the old lady, although she still looks like and sometimes acts like a pup. She’s just being grumpy when she goes to the vet, right? Anyways, once we leave the exam room she turns into a happy dog. She walks around sniffing everything. She walks up to the gals working in the office, all while wagging her tail. I think she knows it’s almost time to go home! So about pumpkin. Savory pumpkin. I made this dish for my submission to this month’s Spiked! 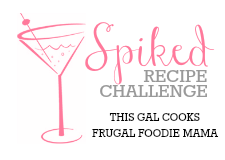 Recipe Challenge hosted by Carrie from Frugal Foodie Mama and I. This month’s ingredient is Fall beers. I opted for Shipyard Pumkinhead Ale. Yea, Beer Advocate doesn’t rate it very well but I like it well enough. It’s not as good as my favorite, UFO Pumpkin Ale, but I didn’t want to use one of those up in this dish. I wasn’t up for drinking a beer the night I made this so what didn’t get used in the recipe got dumped down the drain. Oh the horrible thing I did by pouring part of a beer down the drain. But what can I say. An opened beer doesn’t fare too well in the refrigerator. Ken and I both enjoyed this dish. In fact, we darn near gobbled all of it up. Apparently my recipe is enough to feed all of Kings Landing in Game of Thrones. Not really but there was enough to fill up an 8.5×11 baking dish. But that didn’t stop the two of us from finishing all of it but one serving by Wednesday. I made this on Sunday. 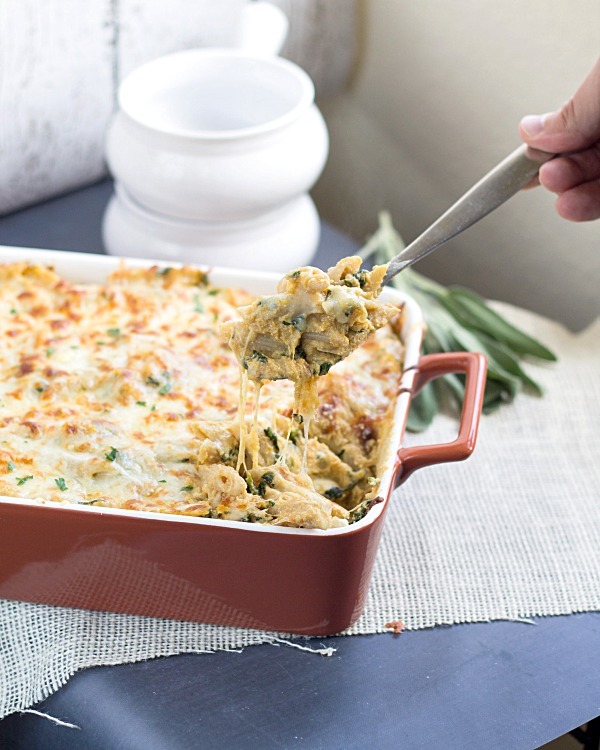 So if you’re feeding a crowd in one sitting or feeding a couple in multiple sittings, your set with this Four Cheese Pumpkin Pasta Bake. Enjoy! In a large pot over medium heat, saute the garlic and spinach in the butter until tender. Add the sage and cook for about 1 minute. Stir in the nutmeg, pumpkin puree, beer, parmesan cheese and ricotta. Mix well. Reduce heat and simmer for 10 minutes. Add salt to taste. Stir the pasta into the sauce. Pour into a greased 8.5x11 baking dish. Combine the remaining parmesan cheese, the mozzarella cheese and the fontina cheese. Sprinkle over the pasta. Bake at 350 for 10 minutes. After baking, turn the broiler on low and broil until the cheese is slightly browned. Julie, I love how you incorporated pumpkin into this baked pasta. Also glad to hear that you had a great week! Thank you, Ashley! Hope you have a great week! 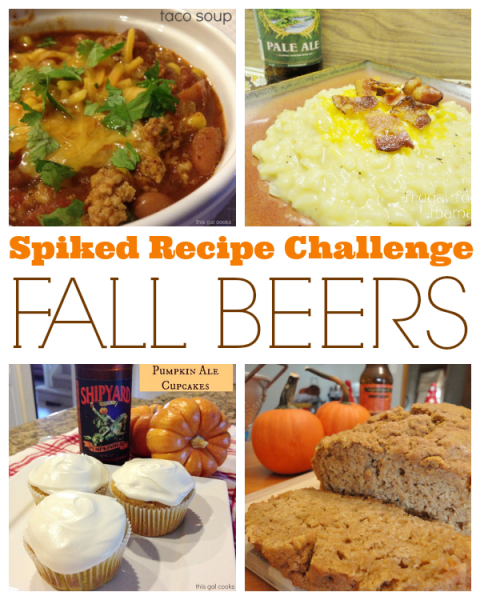 This recipe is so creative with the pumpkin and beer, Julie! I’m really impressed! I have yet to try pumpkin in a savory dish, but this definitely works trying. Thanks for the recipe! Thank you, Andi! You should give it a try. It’s pretty good. One of these days I’m going to make pumpkin soup! This is awesome :) Really need to get on board with some pumpkin baking! Oh my goodness……This looks so delicious! I have no idea why I never thought of putting pumpkin in a pasta dish (even though I love butternut squash and pasta). Plus fall beers (which are my total favorite)? This dish was made for me, wasn’t it? Thank you, Holly! You have to try it! Fall beers are my fav as well! Thank you, Anne! My pup’s appointment went well. She is healthy and doing well and her infection is gone. Yay! Welp, here’s to starting a new week. At least its a short one for me. Hope you have a good one! Yea, you need to get that recipe! I think the next savory pumpkin dish I will make is some sort of pumpkin soup. I’ve seen a few recipes that have intrigued me to give it a try. Hope you have a great week, Tina! I’ve never had pumpkin as a savory, but why not? It’s sorta like butternut squash….and what’s not to love about cheese and pasta? I might be adding this to my Pumpkin Patch Party this year…. Thanks for sharing! It does remind me of butternut squash. You should definitely give savory pumpkin dishes a try. They are delicious! Ok, not only do I love that you created a savory pumpkin dish but that you added Pumpkin Ale to it as well! WHAT?! LOVE it. Can’t wait to try this. I love the addition of pumpkin ale to the already great baked pasta!! What a great idea Julie. I’m glad your week went well. Hope you are having a great weekend too! Thank you, Zainab!Hope you had a great week as well! Love this Julie! It’s got the flavors of pumpkin ravioli with a whole lot less work! Ooo pumpkin ravioli. I’ve never tried that. I must try it! Thanks for stopping by, Kari! This is so creative!!! My boyfriend doesn’t care for cheese but I just might make this anyway!! He doesn’t care for cheese?! That’s pretty amazing. I wish I didn’t care for cheese. I eat it just about every day! Thanks so much for stopping by, Julianne! Very interesting. I love pasta and cheese. It would be good to have a try at this recipe which includes pumpkin. Thanks for sharing Julie! You’re welcome, Judy! This is so good! Have you ever had butternut squash with pasta? It’s similar to butternut squash pasta. yum this looks so delicious! I am pinning it! Thank you, Gloria! Haha, she is my little monster! Schneikies Julie! That’s some tough competition to come up against. That looks A-mazing! This sounds REALLY good! I recently tried a recipe for spaghetti in a pumpkin sauce and it was just okay. I was kind of disappointed because I really liked the idea of pasta and pumpkin. I have a feeling that this recipe would give me more of what I was looking for!! I hope you enjoy it, Angela! It is so delicious! That pasta dish looks amazing Julie!! For obvious reasons I will be avoiding it, but it really looks tasty. ;) I’m glad the pup is doing better. Mine hates going to the vet and always has! Toto, I have a feeling were not in Kansas anymore. Your recipe and photo make me feel like I am in the wonderful land of Oz. thanks for hosting the Spiked challenge. I enjoyed participating. You are very welcome! Thank you so much for stopping by. Have a wonderful evening! This sounds SO incredible, Julie. What a fabulous idea… I think I still have one more pumpkin beer in the fridge… I can’t wait to try this! Hi Julie, this recipe looks fantastic and I am planning on making tonight! One question-in the ingredient list there is no nmention of Parmesan cheese but it is referenced in the instructions. How much parm should I add? Thanks! Oh good, that is pretty much what I added and it came out delicious! I think my husband and I will be taking leftovers for lunch all week! Thanks for getting back to me! You’re welcome! I am glad you enjoyed it! 13 1/2!!! Your girl is getting up there! She sounds so sweet. I have no idea why the vet makes them all nervous. Maybe the smells? This Pumpkin Pasta Bake looks amazing Julie!!! Really delicious! I just made pumpkin chili last week– it is so delicious in a savory dish! Thank you, Heather! I think it may be the smells and just that she is getting older. When she was younger she didn’t like the vet but she didn’t turn into a nervous wreck! Mmm, pumpkin chili. That is something that I need to try ASAP! Pingback: 35 Pumpkin Recipes - Chocolate Chocolate and More!